A hawkish BOC and strong data from Canada has helped Canadian Dollar to remain steady. The pair fell sharply after Fed Chair Yellen failed to deliver any support to the US Dollar as she refused to give any hint of the monetary policy. 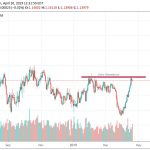 Strong oil prices also give additional support to the Canadian Dollar. Additionally, if the incoming data fro Canada continues to be strong, it could encourage BOC to consider hiking rates again. In the coming week, if Canadian GDP data beats the expectation or if the US employment data disappoints, we could see the pair fall to 1.2300 region and beyond in the long term. 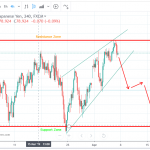 The pair is currently above a massive uptrend line, upon which the pair bounced previously after the initial fall due to the interest rate hike. The pair is on the verge of testing the uptrend line again. 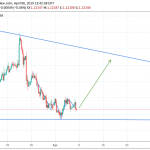 If the pair falls through the line and can keep below the line, it could go looking for 1.22 and even further to 1.20 region. If the pair falls below the long term uptrend line due to the economic data from US and Canada, we think this pair will fall massively.